Whenever I used to think about making pizza, the dough making held me back. I mean anybody can come up with a bunch of toppings and a sauce, right? For pizza dough on the other hand you definitely need an expert or something like that. Well, not really. This is the dough recipe that I’m using every time I make pizza and I never failed. It is very fast and easy to make, and nice thing about it, you don’t have to let it rise, if you don’t want to. Personally I like my crust very thin and not very crispy because I would rather enjoy the toppings than fill myself with bread. However, if you like the puffy/fluffy style you should let it rise for about an hour or more. The quantity that you get after making my recipe, will be enough for two large pizzas, about 16″ in diameter, or three medium 12″. You’ll need a cup and a half of warm water in which you dissolved a tsp of sugar and a pack of instant yeast (2¼ tsp). Now there is a weird thing going on with the altitude and/or air humidity because ever since I moved to Calgary I had to use two cups of water but you might be ok with my original recipe. If you notice that your dough comes out a bit too hard, just add some water but not more than another half of cup. 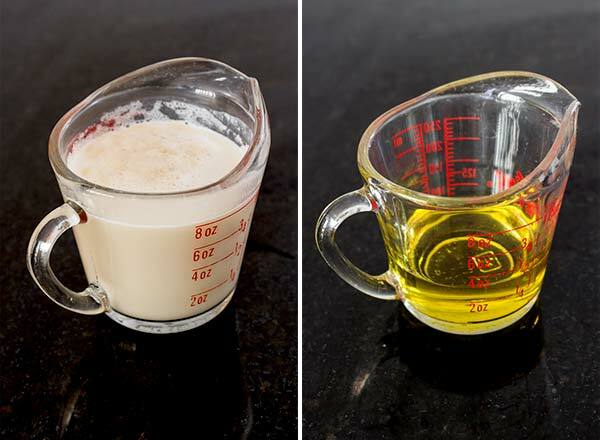 The quantity of a ⅓ cup of olive oil is the same. Add 4 cups of flour and a tsp of salt in the bowl of your mixer, then add the ⅓ cup of olive oil, the activated yeast and whatever herbs you might want to add and give it a serious swirl. Did I mention I love my Pro KitchenAid mixer ? Continue mixing, until everything is well incorporated. Shape the dough into a ball. The dough should be very elastic. You can also get creative, like adding some herbs like oregano or weird spices. I actually made one with maple syrup but make sure you don’t pour too much or it will turn into a cracker in the oven. In 1½ cups warm water pour sugar and yeast; let yeast activate for 5 minutes or until becomes frothy. In the bowl of your mixer, add the flour and salt and mix. Add the olive oil and using the dough hook, mix for about a min. Add the yeast combo to the flour mixture and mix until well incorporated. 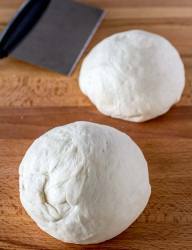 Shape the dough into a ball and place in an oiled bowl, rubbing oil on the dough as well, cover with plastic wrap and refrigerate. If you’re not using the dough right away, you can also freeze it. How long do you bake it for and what temperature? I don’t! I store it in the fridge and use it as needed. For baking requirements check out my pizza recipes, they all use this dough and it is not pre-baked. Quick question, and it may be a stupid one but is the flour all-purpose flour? I do not see in the instructions what to do with the sugar?? I am mixing it in with the dry ingredients. I hope and assume this is correct. Oh my bad, I missed the sugar in my instructions but I fixed it now, thanks for pointing that out. Sugar is used along with the yeast in order to activate it. After you mix you can then roll out right away. Refrigeration is just if you want it on stand by for future use? I have a bread machine that it’s sole purpose is for pizza dough but I also have the kitchenaid….nice knowing that I have a backup option without having to replace anything. I usually refrigerate whatever I have left, the amount you get from my recipe is for two large or three medium. Your direction says 1tbls of sugar but the list of ingredients says 1 teas. From my experience I would say teaspoon, but just checking. you don’t need to let it rise? Nope! You can use it right away. If you let it rise, it becomes a bit too fluffy for my taste but you will probably notice that anyway if you store dough in the fridge for later use, it will rise like crazy. You can also experiment see which style you like the most, nothing bad will happen, your pizza will always be delicious. Check out my pizza category. Lots of ideas there. Can you use active dry yeast instead of yeast? Hi! If I freeze the dough, what I need to do wiht it when ready for bake the pizza, do I need to let it at room temp?? This is the best pizza dough recipe EVER. We make Pizza at home often, I misplaced my recipe book so went looking for a recipe, so glad I did. Thank you! It is definitely better than store bought. Thank you for publishing this recipe! Be well! I’m actually a dude but thanks for the warm message anyway. Glad you enjoyed it, we have been doing our own pizza for years now. I use honey instead of sugar. Do you use fresh yeast (the clay like stuff) or dried yeast? For everyone asking about temperature and time, most of her recipes call for 500F/250C, for 10-15 minutes. I check at 10 minutes and keep peeking through the oven window until the edges are golden brown. Thank for this recipe, it is by far my favorite go-to for pizza night! I don’t have a kitchen aid mixer, so can I still make this and how? Just as easy using your hands. Kneading is not a bit deal. Huge hit with the family. I’ve tried several crust recipes that just weren’t really worth making. This one sure was though. Thank you for sharing! I want to use your recipe to make a school cafeteria dish from my childhood. It was a meat roll probably using canned beef at that time. Rolled up in a yeast dough, cut into pinwheels and baked. Do you have a recipe like this? Nope, not with meat anyway! I want to find a way to form my crusts and then freeze them on pizza circles until ready to use. Would I need to par cook them first BEFORE FREEZING? Also, could they go into the oven in the frozen state if I did that? This is what I do, make the dough, cut the piece that I want/need and make the pizza. The leftover I shape it into a ball or whatever shape you want and freeze it. When I want to make another pizza, I take it from he fridge and give it time to thaw; I am not using it frozen. 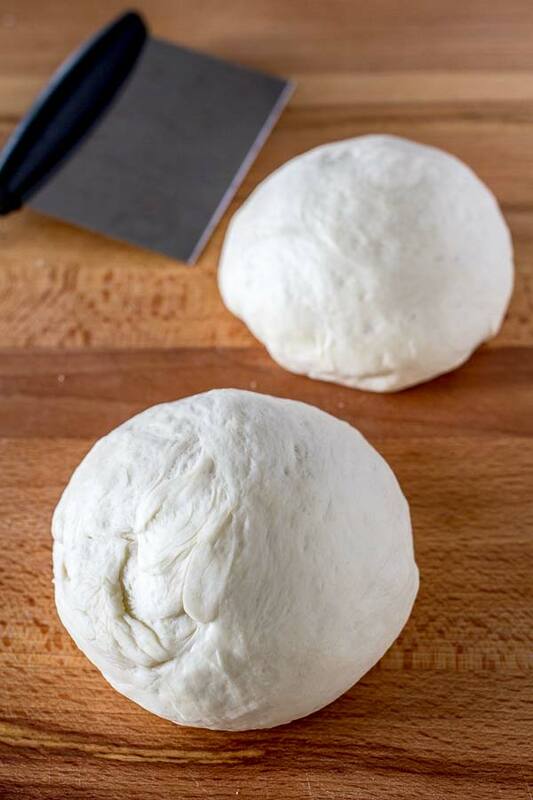 Form your crusts and then freeze them on pizza circles until ready to use ( without par cooking them first before freezing ). Add sauce and toppings (Or add sauce and toppings just before using the frozen pizza crusts.) Then it may take just a few minutes more to cook the frozen pizza. 500F/250C for 10-15+ minutes. Wish I could figure out what I’d did wrong? I followed directions exactly but my dough did not look like your pictures. Seemed like it had to much liquid, so I added more flour which resulted in a tougher crust. Loved the flavor though! In the picture with the water and yeast it looks like 1 cup of water. Did you add the additional 1/2 cup later? Yes, I did! The recipe I wrote worked the best for me but baking is not an exact science unless you make the same thing over and over in the same conditions and location. I found easier to add more water and have the dough softer then the other way around, because adding more flour than needed, can turn into a nightmare. In your case, I would remove a quarter of cup of water next time and see what happens but you can keep the rest of the ingredients the same. I have a few issues if anyone might know how to fix them: 1. No matter what I do the dough is always sticky… I mean its a mess. I flour my hands, flour the work area, ect. But it still sticks really bad. The dough mixes and rises in a bread maker and I follow the recipe exactly (i’ve tried a few others too, similar issue with stickiness) but its still like molding glue. Any thoughts? I mean I easily go through adding a extra 5 cups of floor just to get it stretched… Which I think causes my next issue: 2. My dough can be 3 inches thick but it always tears! Needless to say, tossing it isnt happening. Is that due to the unending amounts of flour im having to use to make it workable or is the dough not setting right? I live in Alabama (high humidity, no AC/Heat but im doing this in the summer) if that can be a factor… Any help is appreciated because I would really like to work out these kinks! Thank you in advance! 1. super sticky usually means too much water, adjust the quantity as needed. 2. yep, too much flower. you will get better results if you lower the water quantity from the start. 3. humidity and altitude are usually important factors. Start with 1 cup of water and see how it goes. I try to avoid adding more flour to a recipe because it tends to turn things for the worse but you can always add a bit more water if it is too hard. Baby steps and you will find the perfect combination that works for you. Most of the times, even the flour quality can be a factor. Baking is not exact science I’m afraid. How warm does the water have to be in order to activate the yeast? It doesn’t really matter but I use normal olive oil. Can i use self rising flour in replacement of the flour and yeast? Never worked with that, sorry! Any idea how many pounds of dough this makes? Nope but it should be easy to estimate. What is the temperature of the warm water that’s added to the yeast? I like the recipe. I’m goig to try it out tomorrow for lunch. As far as the funny stuff you mentioned happening with the water increase, it’s because of the altitude. Ran into the same when I lived in Vegas. Was @ 2600ft and I did have to make adjustments to liquid in recipes. OMG! I just made this tonite-freaking awesome! 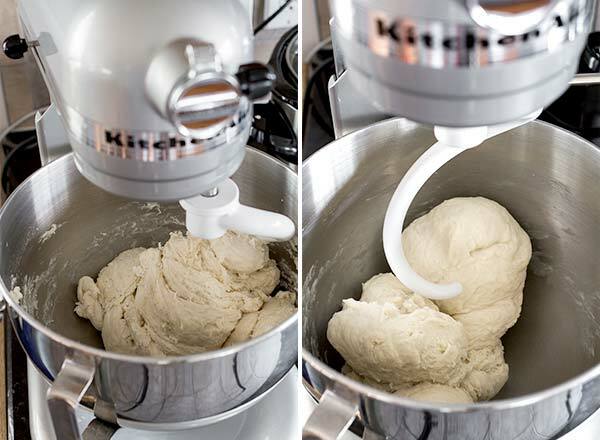 I always did pizza dough in my bread machine…no more! This recipe is the bomb!